Multinational Employee Benefit Pooling is verzekeringsconstructie om flink te besparen op de kosten van employee benefitsregeling (EB). Er is dan een goede kans dat er grote financiële voordelen te bereiken zijn met pooling van deze EB-kosten. Vooral voor grotere concerns is deze vorm van internationaal verzekeren populair. Maar ook voor het kleinere MKB met buitenlandvestiging(en) zijn forse verlagingen van de collectieve premies te incasseren. Multinational Pooling is in feite een vorm van internationale winstdeling, waarbij zoveel mogelijk collectief verzekerde overlijdens- en arbeidsongeschikheidsrisico’s van een multinational worden samengevoegd om de multinational en al haar deelnemende dochterondernemingen optimaal voordeel te laten behalen uit haar totale groepsvolume. Wereldwijd beheer van lokale employee benefits regelingen voor alle werknemers van een multinational. Wereldwijd beheer van kosten van al deze regelingen. Jaarlijkse financiële rapportage van alle gepoolde verzekeringen. Jaarlijks uitbetaling van de poolingwinst. Vooral de poolingwinst levert al snel een forse verlaging van de collectieve premie op waar elk hoofdkantoor met genoegen kennis van neemt. International pooling is the ultimate leveraging instrument for group insurance, in that it combines the buying power of large organizations with the customized services of local service providers. Initially, only the largest companies could take advantage of multinational pooling. We can offer you customized international pooling programs that are now available not only for a select few, but for a wider range of companies, including small and medium-sized businesses operating across borders. At the end of the calendar year, a local network partner reports the result of the local plan to the coordinating office. The accounts for the plans gathered from the various countries are compared with the total local incomings and outgoings. In the event of a positive result, the multinational parent company (usually the holder of the pool) is entitled to an international dividend. The products pooled have to be contracted in at least two or more different countries, under the terms of local agreements. Please contact us if you want further information about multinational pooling for small and medium-sized businesses. Crucial for a correct mutinaltional pooling insurance offer is accuracy of the collected data. Most of the time this is relatively painless. Ancial picture for each country is all that is needed. The forms are collected by us and summarized. They are then submitted to the insurance networks for a bid. Call us now to start 2009 with a crucial lowering of your international insurance costs. With multinational pooling you take the insurance contracts of your company’s subsidiaries insured through local insurance companies around the world, and combine them into an international portfolio, called a pool. First you consolidate the data from all the contracts and countries in your pool to produce an overall profit and loss account. By balancing any losses in one country against gains in another, we can calculate the overall experience of your company-specific pool. If there is an overall positive balance, the pool will pay it out in cash as an international dividend. If there is an overall negative balance, usually due to unexpectedly high claims, the pool will not ask you to compensate, unless you have opted for a self-retention. It is always very difficult to do any “crystal ball” gazing to predict what will happen in the future. Sometime a better yardstick is to look at a variety of trends derived from various indicators around the globe. These trends usually set the stage for short and long term economic, political and sociological predictions. The positive result of studying trends is that you can not only become better informed in knowing in which sectors of the industry you should invest your money, but also on being able to make good choices when selecting a career. Our company specializes itself in an interesting aspect of globalization in the insurance-business. This is called Multinational Pooling. Starting with our own industry – Insurance, where are some of the trends pointing to? As a result of globalization and deregulation, the Insurance industry has gone through a tremendous transformation over the past decade. International pooling enables companies to leverage the advantages of group insurance and employee benefit schemes by spreading risk across a wide number of business units, either within the company or across several companies. 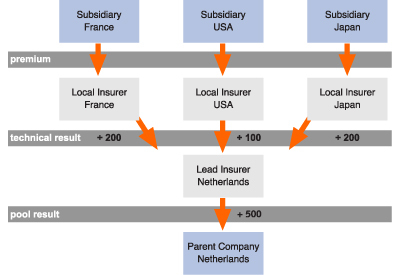 Here is a simplified example illustrating the advantages provided by pooling for the overall results of an international company. The consolidated result is positive, at 38,000. International cost (risk charges and administrative costs), 17,000 in the example, is deducted from the consolidated result. The balance, at 21,000, is the international balance which is payable to the parent company. Please call us if you want further information about multinational pooling. Pooling means combining risks in two or more countries. Local Employee Benefits schemes are brought together and treated as a single entity. This means that multinational pooling is in fact a layer above these local contracts, which allows a better spread of risk and results in economies of scale to the advantage of a multinational company. Under this system, the company can benefit from favourable claims experience on a larger scale. This system is often referred to as “experience rating” and implies a cost-accounting mechanism with a number of income and outgo items that produce a balance. If this balance is positive, it is returned to the multinational (in part or as a whole) as a dividend. Imagine the following scenario – your financial director walks in with half a million US dollars and asks you to throw them away. Would you do this? No, of course not. But when a company is not taking advantage of multinational pooling, this could be happening. Example Profits MP. Boost your profits and financial gains with Multinational Pooling. In more recent times, the era of mergers and acquisitions has resulted in companies inheriting pooling arrangements, giving rise to multiple (four or more) pools. While these phenomena are not negative, and are generally preferable to having no pooling arrangements, they represent a default position that could be improved by active participation and management. We can help you to coordinate this process. Please call us if you want an offer to start a Orientation phase. At the end of this Orientation phase you will receive a report on which you can decide if you want to start a more extensive Research phase. Multinational pooling allows multinational companies to benefit and profit from favorable insured claims experience on a global basis. It is essentially a second stage accounting of insured employee benefit plans on an international level. International profit sharing allows multinational companies to obtain experience rating over the borders of the countries or territories in which they operate.Multinational pools are made available by networks of insurance companies cooperating together to provide cover for mutual clients. Some networks are wholly owned by global insurers and others are a partnership of top rated companies working together under an agreement of cooperation. Het wordt voor grotere bedrijven steeds belangrijker scherp te calculeren. De kosten stijgen en door de concurrentie staan marge steeds vaker onder druk. Genoeglijk achteroverleunen, ook voor groot-MKB of multinational is verleden tijd. Het verhogen van de omzet en de bijbehorende rendementen kan niet zonder een kritische kijk op uitgaven binnen elk bedrijf. Maar ook andere vaste kosten kunnen vaak sterk beperkt worden. Dat is veel efficiënter dan de omzet of opbrengst verhogen. Met bestaande of alternatieve dienstverleners kan onderhandeld worden over de laagste prijs. Dat kan vaak zonder ook maar iets af te doen aan of compromissen te sluiten over de bestaande kwaliteit van het product of het serviceniveau dat men ontvangt. Denk daarbij maar eens aan telecommunicatie, wagenparken, leasecontracten, koeriersdiensten, zakenreizen, schoonmaakdiensten, kantoorbenodigdheden en schadeverzekeringen. Afhankelijk van de categorie zijn gemiddelde besparingen van 20% al snel te realiseren. Sommige bedrijven doen dat zelfs op no cure no pay basis zoals Expense Reduction Analysts. De fee bedraagt veelal een percentage van de besparing de eerste anderhalf jaar. En wilt u een lagere premie voor uw huidige bedrijfsassurantiepakket, bel ons dan even.